Shelves are one of the easiest and simplest ways to store your books and other small decorative items. Shelves are great to spruce up the décor of your event with their amazing design. We offer a wide range of Shelves and Bookends that are not only designed to add artistic innovation and elegance to the event décor, but also offer high functionality. Made of the finest woods or best grade metals like Nickel, the shelves and bookends are finished to perfection. Whether you are searching for classic & rustic wooden only shelves/bookends or the more innovative combination of wooden and metal shelves/ bookends, we have a wide assortment of products that will suit the décor of your home/office and your own persona. 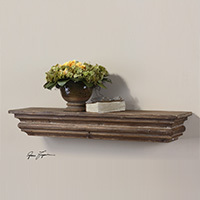 Some of our bestsellers in this niche include Gualdo Aged Wood Shelf and the Book Distressed Bookends. Buy these shelves for the ease with which they blend into the existing décor, helping you conserve space, and add a scholarly persona to the ambience. Accent Shelves There are 14 products.